This recipe is from The Splendid Table’s How to Eat Supper cook book by Lynne Rossetto Kasper and Sally Swift. It has 4 shades of vibrant green and a great blend of flavors and textures. This dish is so cheerful and healthy looking that it makes me happy just to look at it! String the sugar snap peas with a small, blunt knife. Grasp the stem between your thumb and the blade and pull down the length of the peas pod. Rinse the pea pods and dry them thoroughly. Heat a wok or a straight-sided 12-inch sauté pan over high heat. Swirl in the oil. Add the onion, sugar, salt and pepper and toss over high heat for 1 minute. 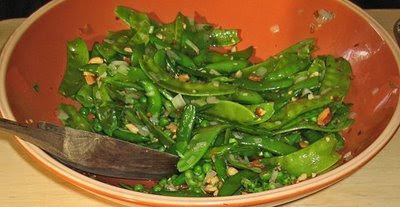 Add the sugar snap peas and toss for 30 seconds. Stir in the snow peas and cook for 20 more seconds. Finally, add the frozen peas and stir-fry for another 20 seconds or until they are thawed. Turn the peas into a serving bowl and toss with the mint and almonds. Serve immediately.